Below is the report of the first visit by Joy Huson and (former) Labor Party MP and Minister (from 1978 to 1999) Gareth Evans MP to the Baxter detention centre. The letter is remarkable, because had it not been written after the first visit, it may well have never been written. The personal involvement and the shared pain would have intensified, and as a result the level of observation in detail may have diminished. Please read on and ... shiver. 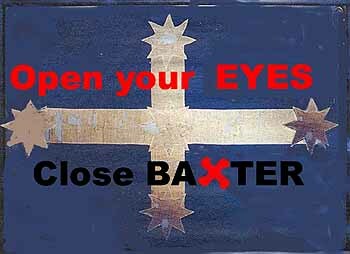 18 August 2005: When the Baxter fence closes: life after permanent detention - Life after Petro Georgiou seems to have changed considerably with detention centres running near-emtpy for asylum seekers. But, has it improved? 30 March 2005: Once You've Been to Baxter You Can't Sit on the Fence - By Anna Rose, NUS National Environment Officer: "I spent this Easter in the desert. I spent this Easter protesting at Baxter detention centre to draw the world's attention to the injustice of Australia's racist and inhumane mandatory detention system and treatment of asylum seekers." Gareth and I got home last night from Baxter Detention Centre in South Australia where we have been visiting a young refugee we have supported for some time now. To protect his privacy we have changed his name to 'Arif'. He has been in detention for the past four years, formerly at Woomera and more recently Baxter. We are both overwhelmed with the life-changing experience of our visit and are very keen to tell our friends just what is actually going on. Whilst Cornelia Rau's ghastly experience has outraged Australians, her case is not atypical and similar treatment has been happening on a large scale to refugees in detention across Australia. Her case does expose the treatment of people by DIMIA, the bungling by Public Services and the "I didn't know" from politicians who surely are required 'to know'. Shamefully Cornelia's case is the tip of the iceberg. Baxter is over 3 hours drive from Adelaide and 13 hours from Melbourne and is located 12 kilometres beyond Port Augusta, on the edge of the desert. At first sight visitors are struck by the remoteness and hostility of the environment. A more arid and depressing location could not have been found. The site is managed by a private company, Global Solutions. You must present yourself to the Administration Office to be fitted with a hospital-type wrist band and have the back of your hand stamped with an infra-red sensitive stamp. You then wait until all the visitors for that particular visiting session have been 'processed' before going to the major outer fence entry point. Enter a wired chute, wait for everyone to get in, one door closes behind you - walk through the chute to the other end - door opens. Proceed to another administration office wait (outside - all weathers) until everyone including the guard arrives - the door opens - 5 visitors at a time allowed entry for further 'processing'. Once inside, you walk through a detector and submit to the handheld wand detector around your body. Items/food brought into the centre are placed in the x-ray belt and once through that are opened and inspected. Once this has been completed you wait outside again in another outdoor caged area, for the rest of the visitors to complete the 5-at-a-time process. When all are ready, you are shepherded across to the 'visitors centre' to be admitted - 5-at-a-time - into a corridor and the door behind closes then internal door opens. THEN YOU ARE IN - and you WAIT. Only then, the detainees who are to be visited are called to the Visitors Centre. Often by this time 30 minutes of precious visiting time has elapsed. When you visit a detainee at Baxter, you are permitted to take food for them but they must consume it all during your visit, they may not take any back to their compound to share with their friends or to eat later themselves. If you bring photos to the visitors centre - you are only permitted a maximum number of 20. So you decide which 4 in your packet of 24 you must leave behind. This is an improvement on the previous number of photos allowed - 4. If you send flowers to a detainee (say for a special occasion) they must be delivered to Administration and are not given to the recipient until the next day, or the next or even a week later (as in one instance). Many times they are limp and dying when they reach their intended recipient. You may not leave any gift items at the Administration Office for detainees - even simple comfort items such as soap, tea, toothpaste etc. They must be posted in to the Administration Office via Australia Post. Food is supplied in insufficient quantities at Baxter, so most of these young men and women are hungry much of the time. The food that is supplied often contains weevils and maggots, fruit is windfall and the vegetables are of very poor quality. Toiletries are of the poorest commercial quality! ALL detainees are suffering varying degrees of depression. Most have to have sleeping tablets to get any level of sleep at night (lights on). Many of the guards at Baxter take an unhealthy pleasure in their work at the expense of detainees. Any detainees who complain lose 'privileges'. Often at Baxter the duty guards don't call the person you are visiting straight away. If you enquire, as we did, you are told - "They don't always want to see their visitors - we can't make them see you". This is blatant as the detainees will tell you "I've only just been called even though my name was on the list this morning". We waited an hour (out of a two hour visit period) for 'Matteen'. This is widely believed to be a deliberate act perpetrated at the whim of the guards on duty. Matteen had toothache and had his name down for a visit to the dentist for three months before they finally told him he was off to the dentist one day. He was handcuffed with a guard either side of him, they looped their arms through his arms and held on to the back of his trousers and frogmarched him from the transport van into the Port Augusta dentist's surgery. They stood either side of the dentist chair throughout the procedure and the handcuffs were on the whole time. Matteen is one of the most gentle souls you could meet and was mortified at the shame of this. One young man we met in the visitors' centre told us his poverty stricken wife struggled for some time with his indefinite detention before finally divorcing him. He told us he has attempted suicide 5 times (this is a widely known case amongst visitors) and yet he remains in detention where he has been for nearly 4 years. Arif has not informed his family of his incarceration. They wonder why he is not working and sending money to help their dire circumstances. He says it will kill his mother if she knew he was in 'jail'. Matteen believes his father has died (or at least is gravely ill) and his uncle with whom he has scant contact, won't tell him the truth for fear of upsetting him. He worries who is supporting his wife, children and mother if this is the case. Five of the male members of his family have been killed by the Taliban who are still active in his region of Afghanistan. We met many lovely young people while we were at Baxter Detention Centre. All, without exception, came over to us to shake our hands, to thank us for coming to visit. Even though we weren't there to visit them specifically they stop for a chat. They are so hungry for human contact from 'outside'. Their dignity and gratitude for our 'kindness' was humbling. Many cases are currently before the Minister for review, including Arif's and Matteen's. In Arif's case, in December he was granted an Afghan passport by the Afghanistan Embassy in Canberra - until then, DIMIA had insisted he was Pakistani and "not at risk" if deported. His case is now before Minister Vanstone to lift the bar on his re-application for a Temporary Provisional Visa. If the Minister agrees to this, he may have to undergo the whole interview process again - from what we understand, a harrowing ordeal, given his current psychological state AND he will THEN undergo health and security checks. Until then, we await Senator Vanstone's pleasure.